Signals and Systems tutorial is designed to understand about analysis, types, convolution, sampling and operations performed on signals. It also describes about various types of systems. 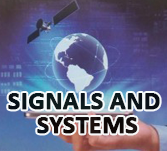 Signals tutorial is used for students and all beginners who are interested to learn signals and systems in simple and easy steps. This tutorial gives you an overview of Signals and Systems concepts. One should have basic knowledge of differential and integral calculus, limits and adequate knowledge of mathematics.